Since its first release five years ago on October 23, 2001, the iPod has become one of the most recognizable products in the world. It has transformed Apple’s business and its public image, and is probably responsible for a “halo effect” that has improved the Mac’s image and fortunes as well. Whether you’re a rabid iPod lover or someone who just doesn’t see why the iPod’s such a big deal, it’s hard to dispute the gigantic impact the iPod has had on our technological world. On the day the iPod was unveiled, none of us knew we were witnessing the arrival of the first iconic product of the 21st century. We had a pretty good idea we were going to see an Apple music player, but we got more than we were expecting. 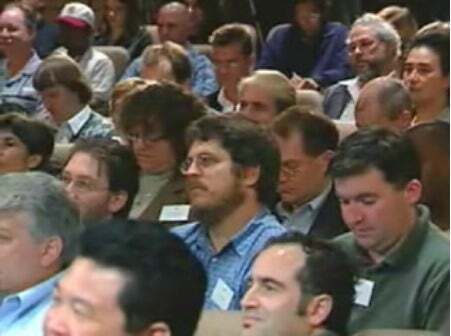 I was there with Macworld’s Rick LePage, Jonathan Seff, and Philip Michaels—if you look at the video of the event posted on YouTube, you can see us in one of the cutaways. Steve Jobs’ breathless and excited pronouncements are often derided. It’s hard for me to go to a Jobs presentation without hearing someone make a crack about the famous “Reality Distortion Field” around Apple’s CEO. But in the case of the iPod, on this particular October day in 2001 Jobs couldn’t have been more right. Holding one of those first-generation iPods in my hands today, it’s striking just how much the iPod hasn’t changed in five years. It’s still a white block with a stainless steel back. Sure, the details have evolved: the edges were sharp, but now are smooth; the screen is now colorful and capable of displaying photos and videos; the scroll wheel doesn’t physically move anymore. But that original iPod—with its 5GB hard drive, full-sized FireWire port, and $399 price tag—got a remarkable number of details right the very first time. No wonder it became such a success. In going through my notes of the iPod’s introduction, I’m amused by the fact that only one product announcement was worthy of an exclamation point: “iTunes 2 announced! !” Yes, I granted the iPod a simple period, but devoted two whole exclamations to an update to iTunes featuring MP3 CD burning, crossfading, and an equalizer. At the end of the event, we all took home pre-release versions of the iPod, which were already loaded with music. To make the point that the iPod wasn’t meant as a vehicle for music piracy, our iPod packages also contained a stack of audio CDs, the contents of which matched the music pre-loaded on the iPod. The beta version of iTunes that we took home after the event let you drag music back off of your iPod and into iTunes—but Apple made the point of informing us that with the final version of the software, that feature would be shut off. “Don’t steal music” suddenly became one of Steve Jobs’ favorite catchphrases. What did Macworld think of the iPod back then? Honestly, we were about half right. I think most of us understood the product immediately: on the drive back to San Francisco from Cupertino, I discovered that both Rick and Jon already had more than 5GB worth of MP3s in their iTunes libraries. My total was a bit less than that, meaning that I could fit my entire digital music library onto that tiny little iPod. But I admit that we were hung up a bit too much on the price. “Priced at $399, the iPod does not come cheaply,” we wrote the next day. “The Apple iPod sounds like a dream come true… Although $399 is a hefty financial commitment, it buys you a unique Apple product that you’ll find yourself using everywhere you go.” Well, okay, it turned out that people still bought it at $399. The product was simply too good to be slowed down by a high price tag. Five years later, I think we’re more than half right, but I’ll leave that judgment to the guy writing in this space in the year 2011. In the run-up to the iPod’s anniversary, I’ve spent a bit of time reflecting on what was happening five years ago. A lot of that nostalgia was spurred on by former Macworld columnist (and current Newsweek contributor) Steven Levy’s latest book, “The Perfect Thing: How the iPod Shuffles Commerce, Culture, and Coolness” (Simon & Schuster, 2006). In the book, the New York-based Levy laments that he couldn’t be present at the iPod’s launch, but reminds us that in those days so soon after the September 11 attacks, flying across the country was a traumatic event. (On the brighter side, Levy got to be the first person to lay an iPod on Bill Gates.) I had the good fortune to chat with Levy about his book on the most recent edition of the Macworld Podcast. Five years ago my wife and I were expecting our first child. When I came home with that sample iPod, I suggested to her that rather than burning a CD of soothing music to play in the delivery room, she could build a playlist that we would load on the iPod. Over the next few weeks, she built a playlist called “Baby,” and I synced it to the iPod. I brought the iPod, a cassette adapter, and a boombox to the hospital, and played it during labor. I’d like to think that, outside of Apple, my daughter—born three days before the iPod started shipping—was the first of thousands of kids to come into the world to the sound of an iPod. So forgive me if I get a little sentimental when I talk about the anniversary of the iPod. Yes, it’s a great product that has changed the course of Apple. But I admit it: I’m emotionally attached to the iPod, too. It’s become a part of my everyday life as well as my personal history. Happy Birthday, little guy.